" Was it the kind of success we needed? People say Don't You (Forget About Me) changed everything. What happened was that Simple Minds went from being a big cult band to being on constant rotation on MTV for the next two or three years. For a lot of people that was a great way of finding the band. " By October 1984, the band were holed up in Barwell Court, writing new material (which would eventually become Once Upon A Time). However, they were being pestered by Keith Forsey to record a track he'd written for the forthcoming film The Breakfast Club. Finally the band relented, recorded the song in three hours in a dingy Wembley studio, and promptly forgot about it. With The Breakfast Club premiering in February 1985, A&M began the push to get the single out in January 1985, as proved by the notes on one of the first acetates. The US promotional singles were were pressed in January, as they had to be included in a 12" x 12" box-set for press and radio. The 12" was notable for its graphical sticker, brightening up the usual drab black die-cut sleeve. With no other new material available, A&M were forced to delve into the band’s back catalogue to flesh out the single. As Up On The Catwalk hasn't appeared as a commercial single in the US, A&M simply borrowed its B-side A Brass Band In Africa and A Brass Band In African Chimes. Presumably the film's final artwork hadn't been agreed (suggested by the box set's unique line drawing cover), so the first run of the US singles featured New Gold Dream (81,82,83,84) inspired crosses and fonts. A&M promoted the single extensively, and issued collectable 7” and 12” promos. As the single sold in greater numbers, and artwork from the film became available, the poster design was added to the 7” sleeve to promote the movie further. Don’t You (Forget About Me) went to number one in America on the week ending May 18th, 1985. Suddenly the band were inundated with requests to issue the single in other territories. Initially the band refused, but Jim relented when he heard a footballer being interviewed on the radio who lamented that Don’t You (Forget About Me) was not available in the UK. The band were adamant that the song would not appear on their next album. Virgin reluctantly agreed. Malcolm Garrett was contacted to produce a better sleeve. He used his old trick of borrowing from videos, creating a patchwork of pictures of the band from the Waterfront video. The tie-in with the film was emphasised with the film poster included on the back. A link with previous Sparkle material was kept with the use of a distinctive Simple Minds logo. The single was re-issued in Canada in the new sleeve. This was used as part of the promotion in that territory with a picture of the band now included on the back. With a sure fire winner on their hands, Virgin lazily kept A&M's choice of B-side. 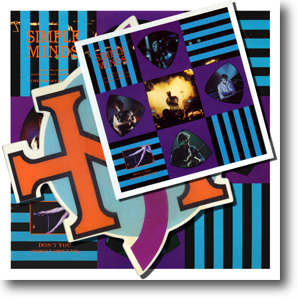 However, with an eye on the collectors, a limited edition shaped picture disc was issued, shaped into the Simple Minds logo from the Sparkle In The Rain album cover. Uncut versions exist, but they’re extremely rare, and only about three or four are known in collectors' circles. 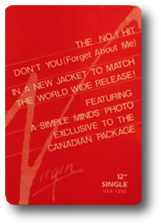 Two overseas editions became popular amongst collectors: the Canadian Issuse featured a different track listing whilst the Brazilian version sported Once Upon A Time style artwork. The single was reisused in 2013 as a limited edition 7" picture disc as part of the celebrations surrounding Virgin Records' 40th anniversary.